Champagny en Vanoise is a pretty, traditional, mountain village, situated in a stunning wooded area at the entrance to the Vanoise National Park, at the base of the south side of the mountain. With excellent access to the La Plagne ski area, the village is perfect for skiers wanting a beautiful traditional setting with access to great skiing. 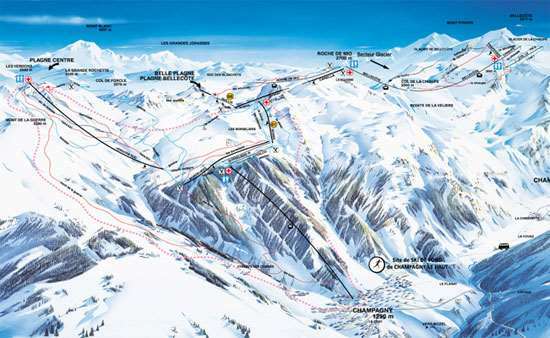 The two terrains of La Plagne and Les Arcs are linked and accessible from Champagny. A skiable space is exceptional for its size, diversity and accessibility - 425km of pistes, 3 glaciers, and 2 summits of more than 3000 metres. The cable car from the centre of the village, takes skiers within 8 minutes to an altitude of 2,000 metres. There are 3 snowparks for snowboarders including a half-pipe on the terrain. There are a range of non-skiing activities offered that include paragliding, ice climbing tower, snowshoeing, a cinema, weekly events such as torchlight descents and games. The village has its own ESF ski school that takes children from the age of 2 years. Pretty traditional French village with great skiing. One cable car and you’re on the fantastic slopes of the Paradiski. From Champagny you can also take a short 20 min drive or get the bus to Courchevel for the day to ski the 3 Valleys so you have the best of both worlds. There is a fantastic bar just opposite the cable car in case you are a little thirsty after a hard days skiing, there are also other bars to choose from but is un-commercialised enough to hold onto it's French charm. I will be returning!